Clunes is a rural town between Maryborough and Creswick, 115 km north-west of Melbourne. It is built in a hilly valley formed by the Creswick Creek, and there are various elevated points from which the town can be viewed. Near the creek, and north-west of the town, a European settler, Donald Cameron, built a homestead. The area is now Cameron Reserve. He named his pastoral run Clunes, after his place of residence in Inverness, Scotland. In 1851 one of Victoria’s first official gold discoveries occurred at Clunes, and a rush occurred for the alluvial gold along the Creswick Creek. After a few years' pause a larger scale operation was mounted to extract gold from the quartz reefs which ran north-south under the western side of the future township. Clunes developed around the reefs and fragments of the town’s first commercial centre remain at the west end of Fraser Street. During the 1860s the Clunes borough (18 October 1860) grew to a census population of about 6000 people. Anglican (1859), Presbyterian (1862) and Primitive Methodist (1868) churches were opened, along with denominational schools and a government school (1863). 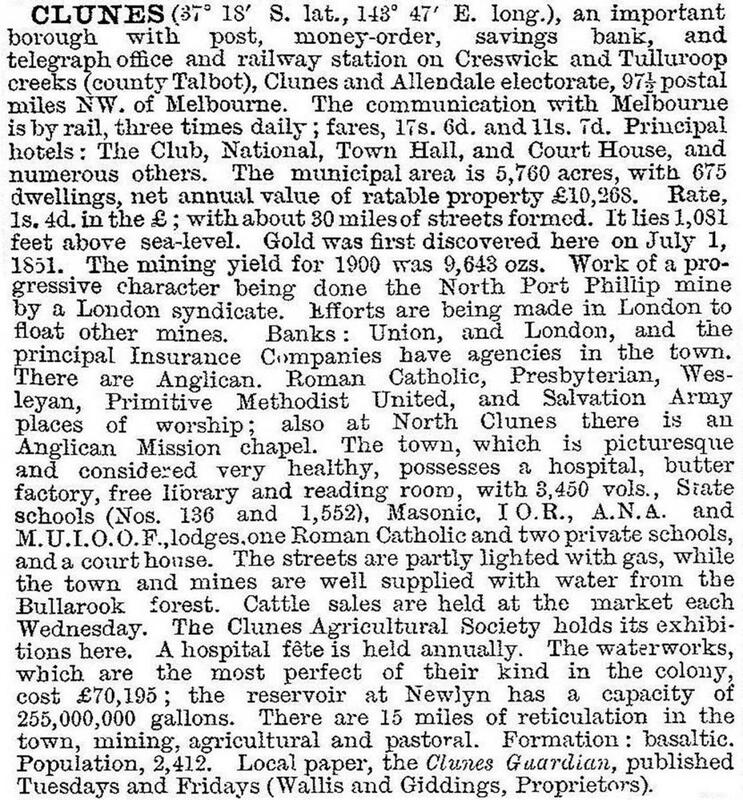 Clunes had three sections: the original (and largest) generally south of Creswick Street; an east-west block north of the creek, granted to Donald Cameron in 1852), and kept generally undeveloped; and North Clunes, a residential and mining area when mining was at a peak. The North Clunes school was opened in 1875, sited on the east-west block, and later absorbed the South Clunes school (1878-1922). 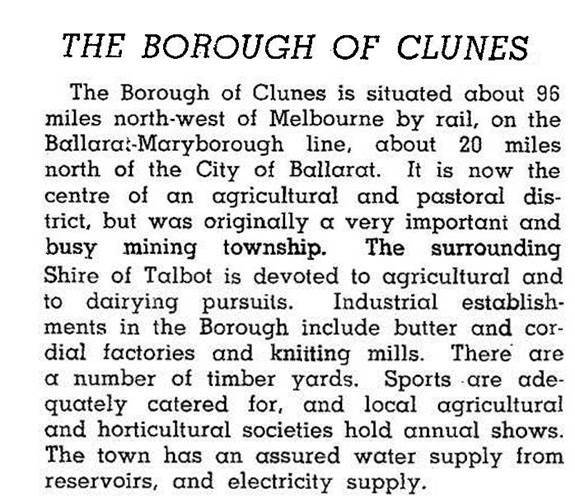 On 31 May 1965, Clunes borough was absorbed into the Talbot and Clunes shire. Clunes’ population fell slightly below 700 in 1971, but has since nearly doubled. In 1981 the Register of the National Estate proclaimed the Clunes Central Conservation Area, approximating four blocks south of Creswick Creek, including Fraser Street’s second commercial area and the municipal and colonial government buildings. The town has been used for shooting period films such as Ned Kelly. In 1988 the Talbot and Clunes shire carried out a heritage study, and the Clunes walking tour map identified over 50 sites and buildings of significance. A museum was opened in a former warehouse in Fraser Street. Clunes has an impressive array of parklands, a botanic gardens and trees planted along Creswick Creek. There are golf, tennis, bowling and tennis facilities, a swimming pool, a caravan park, a showground, two hotels, several public halls and a district health service (in lieu of the hospital). There is a scenic road and lookout, north of Creswick Creek, in Esmond Park (part of Cameron’s east-west block). Clunes primary school had 129 pupils in 2014. In 2007 the first annual Booktown book fair was held, coming soon after the opening of Wesley College’s rural campus in the town. In September 2010 and again in January 2011 many parts of regional Victoria experienced widespread severe flooding. Clunes was inundated by floodwater on both occasions when the Creswick Creek entered many homes and businesses including the caravan park. The median age of residents at the 2011 census was 48 years (Australia, 37 years).